I am a pianist/organist based in southern California and specialize in background music for special occasions, whether it be a wedding, corporate event, party or maybe a sing-a-long. I cover the areas between San Bernardino to Los Angeles to San Diego on a regular basis; I’m happy to discuss out-of-area events as well – just let me know what you require. Are you considering a pianist or organist for your event? If so, then look no further, I can provide live piano and organ music to create the perfect ambiance and atmosphere for your special occasion – turn your event into an occasion with live music, ideal for stimulating conversations or simply to sit back and enjoy. No piano or organ? No problem! It’s always preferable to play a recently tuned grand piano in good working condition but not every venue has one. For those venues without one, I can provide my own digital keyboard along with a PA system which is suitable for both small venues and large venues, and also would be suitable for outdoor use (weather permitting of course). This keyboard can provide a variety of realistic sounds (all of the music recorded on the Media page was done using this instrument) including a grand piano, electric piano, Hammond organ and basic church pipe organ sounds. 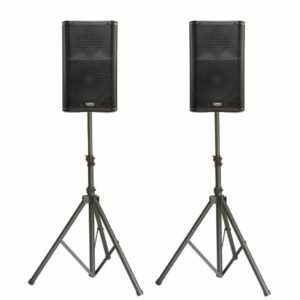 With my 1,000 watt professional PA system, you’ll hear the quality. For questions, please contact me here. To inquire about booking me, go here or GigSalad.